Lots of naches at the Orthodox Green Road synagogue, in the Cleveland suburb of Beachwood, for Jack Lew and Tevi Troy, Orthodox Jews who have reached the highest precincts of governmnt — Lew as President Obama’s chief of staff, and Troy as the deputy health secretary in the last Bush administration. 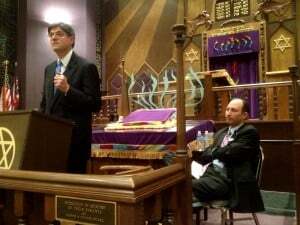 White House Chief of Staff Jack Lew, left, and former Deputy Secretary of the U.S. Department of Health and Human Services Tevi Troy, right. Politics and Orthodox Jewry mixed at Green Road Synagogue last night (Nov. 1) at Green Road Synagogue where more than 125 Jews gathered to hear Jack Lew, White House chief of staff, and Tevi Troy, former deputy secretary of the U.S. Department of Health and Human Resources, discuss the presidential election and their religion’s role in their careers.